Amazon, Berkshire Hathaway and JPMorgan have agreed to create an independent company focused on technology solutions aimed at providing U.S. employees and their families simplified, high-quality, transparent healthcare at a reasonable cost. • The initial formulation of the company will be led by Berkshire investment officer Todd Combs, JPMorgan Chase Managing Director Marvelle Sullivan and Amazon SVP Beth Galetti. • Healthcare providers/insurers are down premarket on the news: (NYSE:UNH) (-2%); (NYSE:ANTM) (-2%); (NYSE:AET) (-3%); (NYSE:CNC) (-2%); (NYSE:MOH) (-2%); (NYSE:CVS) (-7%). In a tweet, CNBC's Meg Tirrell reports that Express Scripts (ESRX -4.2%) "looks forward to hearing more" about the Amazon/Berkshire/JPMorgan healthcare venture aimed at simplified affordable healthcare. • Express says it has reduced costs by $32B in the past year alone related to the management of chronic conditions like diabetes and heart disease, adding that it would like to hear how "we can work together to improve healthcare for everyone." Whole Foods uses checklists called "scorecards" and tests called "walks" to ensure stores comply with a new inventory-management system. 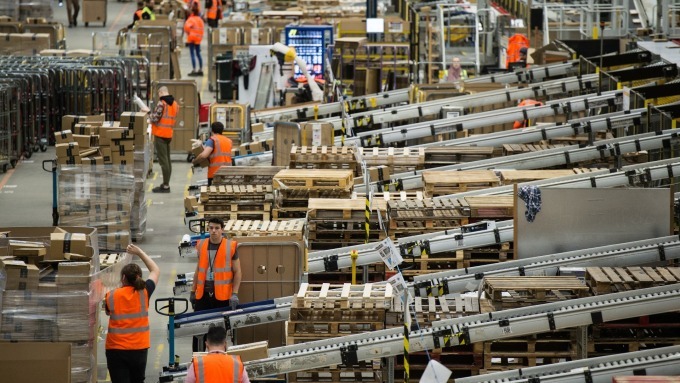 Employees say the system has crushed morale and led to widespread food shortages. "The stress has created such a tense working environment," a supervisor at a West Coast Whole Foods store said. "Seeing someone cry at work is becoming normal." Many employees at both the corporate and the store levels don't understand how OTS works, employees said. The distribution segment generated about $195.9 billion in revenue in the last year. 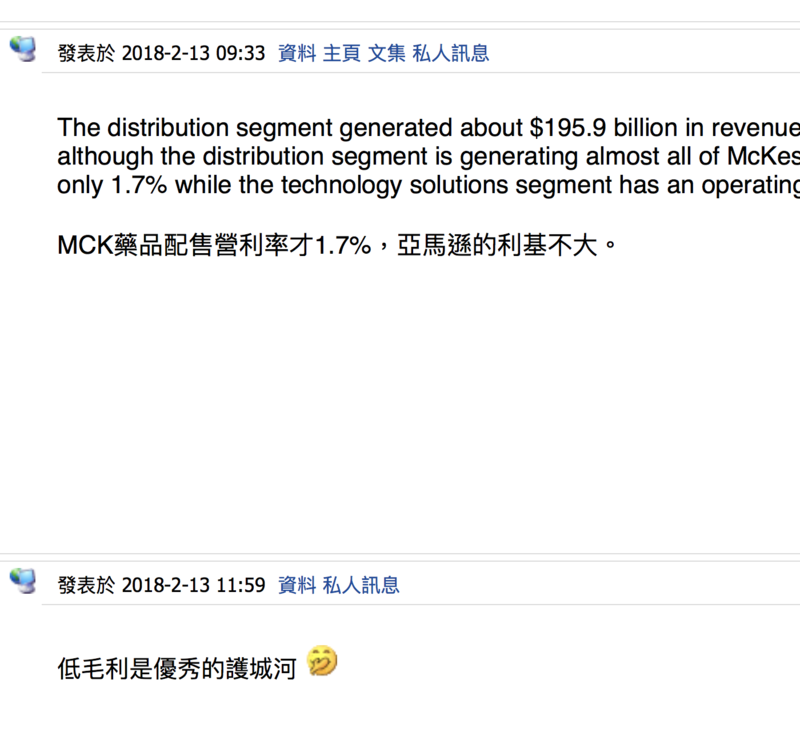 We have to point out that although the distribution segment is generating almost all of McKesson’s revenue, it has an operating margin of only 1.7% while the technology solutions segment has an operating margin of 12-13%. JPMorgan CEO Jamie Dimon thinks the US has an issue when it comes to spending on healthcare. It's what he hopes to change with a new independent nonprofit venture announced in January with Amazon and Berkshire Hathaway, aimed at lowering healthcare costs for their employees. Dimon said he started chatting with Warren Buffett and Berkshire Hathaway investment officer Todd Combs, who also sits on the board of JPMorgan, and Amazon CEO Jeff Bezos. "We said, we know we can do more," Dimon said. "We know we can do more just thinking through every single part of it." One way to improve, Dimon suggested, is by bringing wellness more into the healthcare picture. We also talked to Dimon about the bank's $20 billion investment in the US, the economy, and why he won't run for office. You can read the full Q&A here. Jamie Dimon is fed up with the way America does healthcare. In a conversation with Business Insider's Matt Turner, the JPMorgan CEO explained why he, along with Amazon and Berkshire Hathaway, are banding together to form an independent nonprofit venture to lower healthcare costs for their employees. When it comes to how the US spends on healthcare, it often doesn't make a lot of sense. "Look, America has an issue, OK? We spend 17% of our GDP in healthcare. You know we have the best of all worlds, some of the best healthcare in the world. And the worst of all worlds. We don't do very good preventive medicine. It costs too much," Dimon said. The rising spending is something Berkshire Hathaway CEO Warren Buffett has called the "hungry tapeworm on the American economy." And getting people to be more active consumers in the healthcare system with health plans that feature deductibles—the amount of money paid out of pocket before insurance kicks in — hasn't gone over as well as expected. "Going into deductibles was important to get you to shop a little bit but hasn't really worked really well," Dimon said. The three companies are self-insured employers, which means that when you're an employee going to a doctor's appointment, your employer is ultimately footing the bill for the MRI you receive, rather than a health insurer. The insurance companies are there in the middle to handle the logistics of getting the claim from one place to another. "So I tell people, JP Morgan Chase already buys a $1.5 billion of medical, and we self-insure," Dimon said. "Think of this, we're already the insurance company, we're already making these decisions, and we simply want do a better job." JPMorgan for example has lowered deductibles for employees who make less than $60,000 a year. The deductible can also be tied to lifestyles as well, bringing that deductible even lower. "If you do your wellness stuff now, if you take care of yourself, if you don't smoke, we give you benefits and the deductible effectively goes to zero," he said. "So we've kind of really made it easier for folks to get proper medical care." Dimon said he started chatting with Buffett and Berkshire Hathaway investment officer Todd Combs, who also sits on the board of JPMorgan, and Amazon CEO Jeff Bezos. "We said, we know we can do more. We know we can do more just thinking through every single part of it," Dimon said. Whether that be giving employers more information on their phones, which could in turn help with their overall wellness. Keeping employees healthier for longer in turn could cut down on healthcare spending by preventing patients from getting sicker. "There are ways that, when you face this, maybe we can change things to make it much better for everybody," Dimon said. "We want happier employees, better medical outcomes, and I do think at the end of the day that'll actually be cheaper." Following is a full transcript of the conversation. Matt Turner: JP Morgan announced an initiative with Amazon and Berkshire Hathaway. How did that come about, and what are you hoping to achieve there? Jamie Dimon: Look, America has an issue, OK? We spend 17% of our GDP in healthcare. You know we have the best of all worlds — some of the best healthcare in the world. And the worst of all worlds. We don't do very good preventive medicine. It cost too much. Warren Buffett calls it the tapeworm of corporate America. Going into deductibles was important to get you to shop a little bit but hasn't really worked really well. So I tell people, JP Morgan Chase already buys a billion and a half dollars of medical, and we're self-insured. Think of this: We're already the insurance company, we're already making these decisions, and we simply wanna do a better job. And in conversation with Warren, and someone who works for him called Todd Combs, who's one of my board members, who's exceptional, and Jeff Bezos, we said we know we can do more. We know we can do more just thinking through every single part of it. Both the customer-facing part so you might be able to get look at more data on your phone and stuff like that, getting you do wellness. I mean, 20% of our medical expense is at end of life, and a lot of people don't want to go through it — they go through it in a hospital. So maybe we need a legal change of that. A lot of people over-utilize certain medicines, but they also under-utilize it. And it's also silly they have no wellness. Like, if you take care of yourself, I think smoking and obesity — I forgot the number — account for 25% of all medical expenses. Well, that's us! So, you know, there are ways that when you face this maybe we can change things to make it much better for everybody. We want happier employees, better medical outcomes, and I do think at the end of the day that'll actually be cheaper. Berkshire Hathaway’s (BRK-A, BRK-B) vice chairman, Charlie Munger, is “all for” his company and other corporate giants figuring out how to cut costs in the U.S. healthcare system. Back in January, Amazon (AMZN), JPMorgan Chase (JPM), and Berkshire Hathaway announced a partnership where they’re working together to address rising health care costs in the U.S. for their employees. “The existing system runs out of control on the cost side and it causes a lot of behavior, which is not only regrettable, it’s evil,” Munger, 94, said at the Daily Journal’s (DJCO) annual meeting. The Amazon-JPMorgan-Berkshire Hathaway partnership will look at how the incentives have gone wrong and come up with a solution. “It’s not right to bleed so much money,” he said, adding that it’s “deeply wrong” what’s happened. 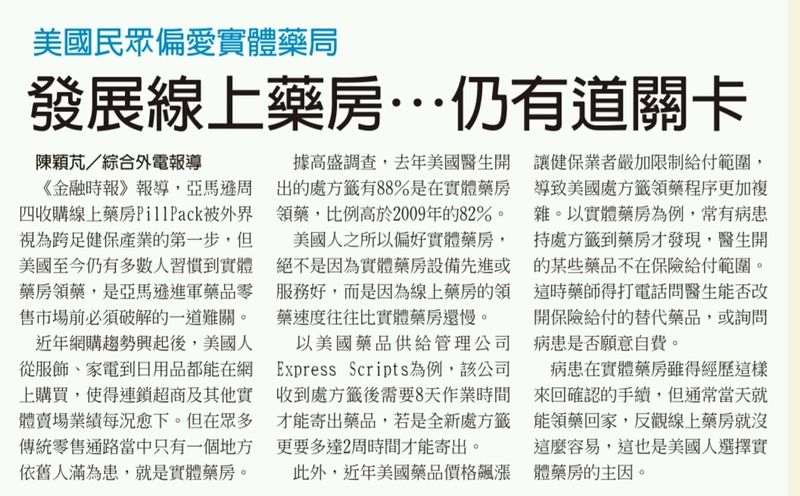 我倒不覺得Jamie Dimon說的東西很空洞,我認為他蠻有遠見的,他說的應該是預防醫學這一塊,不容易做到,可是長期來說會有最大的效果,總比快死了再花一大筆錢好多了,所以文中有提到這是 independent nonprofit venture,應該是這意思. The terms of the potential deal were not known, but a deal could be announced as soon as Thursday. Express Scripts had a market value of $41.43 billion as of Wednesday's close, according to Thomson Reuters Eikon data. • "President Trump rightly recognizes drug companies charge way too much, and their prices need to come down," says Express Scripts (ESRX +3.7%) following today's speech. 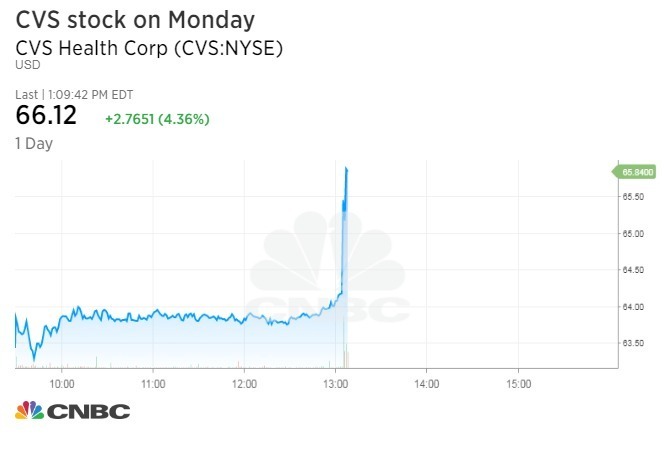 • "CVS Health (CVS +4.3%) is already well positioned to implement many of the key proposals outlined by the Administration," says that company. Berkshire Hathaway CEO Warren Buffett, J.P. Morgan CEO Jamie Dimon and Amazon CEO Jeff Bezos have chosen a CEO for their health-care venture. The group will likely reveal who that person is within two weeks. The three business icons announced in January they would partner to tackle rising health-care costs. Berkshire Hathaway CEO Warren Buffett, J.P. Morgan CEO Jamie Dimon and Amazon CEO Jeff Bezos have chosen a CEO for their health-care venture and will likely reveal who that person is within two weeks, Buffett told CNBC on Thursday. The trio announced in January they would partner to tackle rising health-care costs. Buffett said Thursday they've picked a leader and are "just tidying up a couple of things." In an interview with CNBC's Becky Quick, Buffett and Dimon praised their incoming leader and acknowledged the daunting task ahead. Health-care experts have expressed skepticism on whether the three, while business icons, could simplify the current system. Most agree there's plenty of costs to cut, but they doubt the companies can do it. The interesting thing when interviewing job candidates, Buffett said, was they didn't run into one that "didn't think significant improvement was both possible and important." "It isn't like there's anybody out there that's connected with the system that thinks we've already arrived at nirvana, and they know how difficult the job will be to make major changes," Buffett said. "They're all cheering for us to succeed. "A number of them might not have wanted to be the one to help us succeed ... but nobody disagreed with the mission, the importance of it or the feasibility," Buffett said. "But it's also a very, very tough nut to crack, and it's going to take significant time. We've got the right person." Buffett, Dimon and Bezos haven't outlined how exactly they plan to lower health-care costs. Dimon gave a bit more detail Thursday on where they could focus their efforts. "This is a long-term thing," Dimon said. "We're not looking for immediate success, but there are a lot of ideas out there. There are a lot of things that can be done better. We know the fraud, the administrative costs, we know overuse and underuse of various drugs and specialized procedures. We know the end of life often costs far more than it should and is far more painful than it should be, and with big data, there's so many things to do." Some employees have asked Dimon what the partnership means for them. His response: "We're just going to try to do it better." "And you should expect we're going to do it the right way with the same kind of heart we've had before, which will improve your lives and improve your wellness, improve the outcomes, give you more choice, which I believe you if you do all those things, it will effectively be cheaper," he said. "And you'll have much healthier employees." These three companies aren't the first to take on rising health-care costs. Many have tried unsuccessfully over the years on their own or through alliances. Even Walmart, the nation's largest private employer, hasn't been able to change the system. 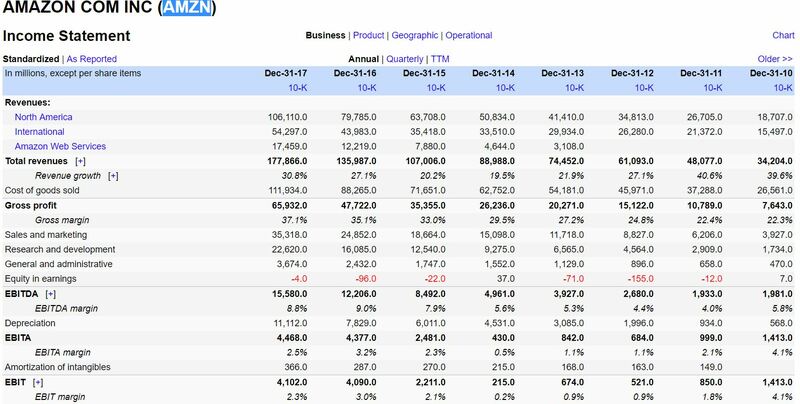 In just four months, Amazon (AMZN)has gone from being the biggest threat to health care industry profits to anunderdog. 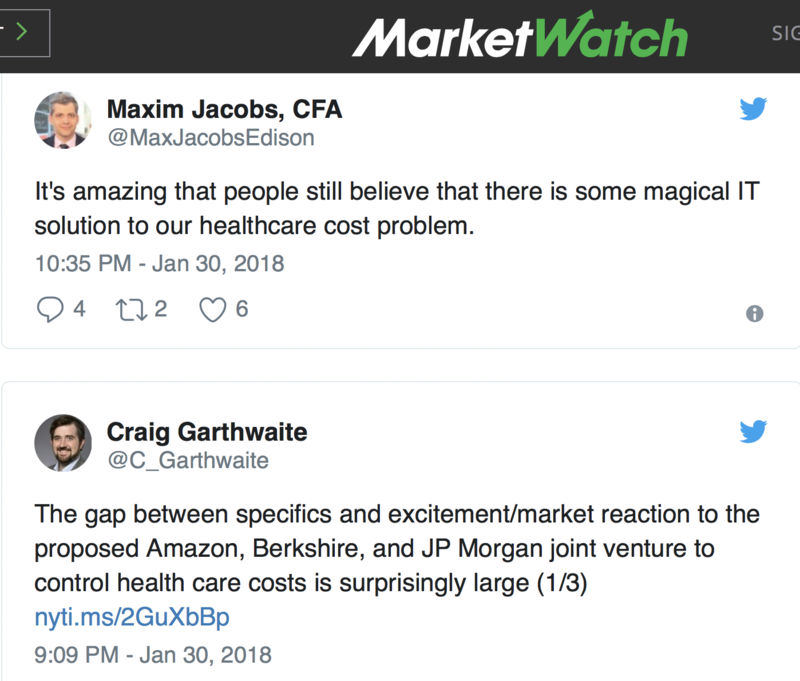 Back in January, when Amazon, Berkshire Hathaway (BRKB)and JPMorgan Chase (JPM)unveiled their new partnership to tame medical costs, the news bulldozedhealth care stocks. Barely four months later, the trio of companies havefound a CEO to lead their venture and plan an announcement within weeks, Berkshire CEO Warren Buffett told CNBC on Thursday. Yet the emerging reality looks a lot less scary than theoriginal idea to health care investors, if Thursday's market action is anyindication. For example, UnitedHealth (UNH),the nation's largest insurer slid more than 4% on that original Jan. 30announcement, while Walgreens Boots Alliance (WBA)tumbled about 5%. But both stocks were higher on Thursday, with Walgreensgaining 0.7% and UnitedHealth edging up 0.1%, close to its all-time high hitthe day before the big Amazon-Berkshire-JPMorgan news. Even though Amazon CEO Jeff Bezos, Buffet and JPMorganCEO Jamie Dimon admitted at the time, "Our group does not come to thisproblem with answers," and said they were in their early planning stages,investors panicked. The only plausible explanation for such an overreactionwas that Amazon had reportedly been gearing up for months to take on the retaildrug industry, while challenging drug distributors and kicking themiddleman — pharmacy benefit managers — to the curb. Yet four months later, Amazon's health care ambitionslook a whole lot less earth-shattering and unlikely to diminish health careindustry profitability for years to come. In April, CNBC reported that Amazon had dropped plans to become a wholesale distributor ofprescription drugs due to the cost and complexity. Investorsseemed to interpret that retreat as decreasing the likelihood that Amazon willenter the retail prescription business. Bezos is clearly comfortable in the underdog role andcan't be counted out. But a whole host of big industry players and technologycompanies have a huge head start. IBD's Computer Software-Medical group isranked No. 10 out of 197 industry groups at IBD Stock Checkup based on stock performance, led by TabulaRasa Healthcare (TRHC), Teladoc(TDOC)and Evolent Health (EVH). • Walgreens Boots Alliance (NASDAQ:WBA) is joining the Dow Jones Industrial Average, replacing General Electric (NYSE:GE), an original index member that's exiting. • “General Electric was an original member of the DJIA in 1896 and a member continuously since 1907,” says S&P Dow Jones' David Blitzer. “Since then the U.S. economy has changed: Consumer, finance, health care and technology companies are more prominent today and the relative importance of industrial companies is less." • Making the change makes DJIA more representative of consumer and healthcare sectors, he says, and correspondingly a better measure of the economy and stock market. • GE's low price in a price-weighted index had it making up less than half a percentage point of impact. • The move's effective prior to the open next Tuesday. Last week's acquisition of online pharmacy startup PillPack will give Amazon insight into people's prescriptions, putting the tech company into the highly regulated realm of health information with more restrictions than it is accustomed to on data-mining. Amazon has mastered the use of personal data by analyzing people's purchasing decisions to predict whether they might buy toilet paper, watch a romantic comedy or ask its Alexa voice assistant for a recipe. Amazon's purchase of PillPack gives it the ability to ship prescriptions to customers' homes in 49 states. PillPack gives Amazon the chance to lure consumers away from the local pharmacy and win all the store purchases that can come with the trip. While marketers can freely exchange data on consumers' nonprescription purchases, demographics and browsing activity, the federal government tightly controls the privacy of medical information through the Health Insurance Portability and Accountability Act, or HIPAA. Companies can't sell patient data to another party or market complementary products based on a person's health condition-like sending coupons for diapers to a woman with a prescription for prenatal vitamins. He said Amazon likely would need to wall off PillPack from its larger operation, otherwise it might have to take steps to ensure the entire business meets federal privacy standards, which govern everything from who has access to data to how user passwords are encrypted. 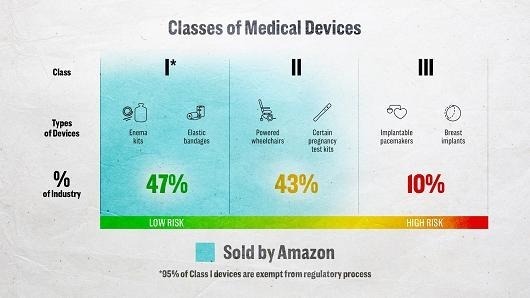 Amazon already has insight into people's health by tracking consumers' browsing and shopping habits. Happy Anniversary, Amazon-Whole Foods. Waht's Changed? 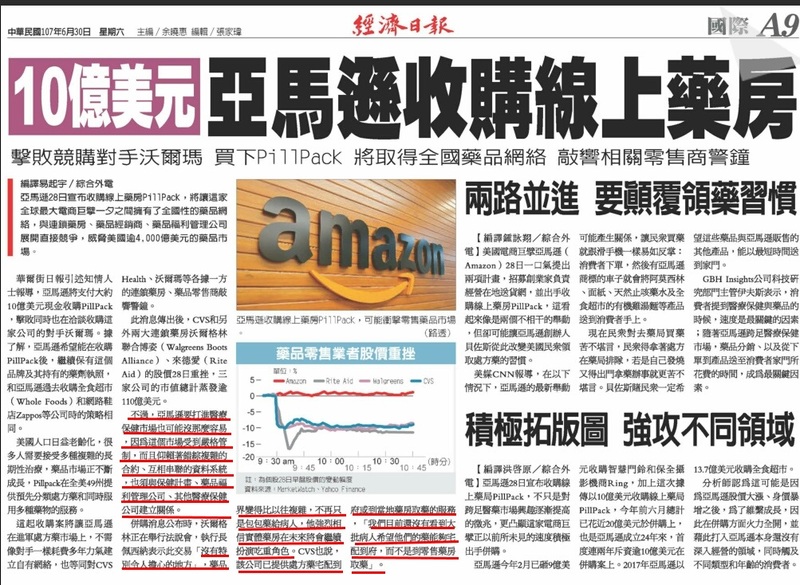 Amazon 買 Pillpack 進入藥品零售業, 是否會發生同狀況?